The Samsung Galaxy Note III will feature a 5.7-inch display, 3GB of RAM and the latest Android 4.3 Jelly Bean, according to the latest leaks coming from Korea’s Business Daily. The alleged Galaxy Note III spec sheet has surfaced and it shows the device will run on the Qualcomm Snapdragon 800 chip and support the latest 4G LTE-A standard, allowing twice the speed of traditional LTE. Most importantly, the G Note III is once again said to come with a 5.7-inch display, and not the 6-inch one we’ve initially heard about from rumors. Design-wise, there seems to be a metal ring encircling the third-gen phablet, adding a more premium feel to it. Samsung is expected to officially announce the Galaxy Note III at its IFA event in Berlin on September 4th. it's metal painted plastic rim..
Its almost identical to the T-mobile SGS2 (SGH-T989). The best version of S2. Considering this "leak" looks different from the last one, I would hold my judgment until I actually see the device or it gets closer to launch time. 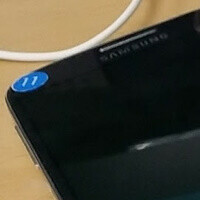 There have been rumors before that suggest that there are multiple Galaxy Note III's being tested right now. So, for all we know this could be just another test device but not the final version. Say hi to Note 2 design, spec bumps, android 4.3, and Samsung's bonus bloatware. Nothing else is new. There is no need for leaks to know what is coming. Nope, thats Sony you are talking about. what about lumia 1020 then?? The design recycle is not as frequent as Samsung's spree yet, even if you consider the first model with that design - the N9. I used to criticize iPhones for looking the same but even i have also stopped it now, seeing Samsung is now the king in recycling. Samsung has at least 2 dozen of phones with the same design, difference only in dimensions and specs. As for bloatwares, not of the apps bundled by Nokia are bloatwares. My friends who have switched to S4 have spoken, compared to S3, they dont like many of the new features and consider them as bloatware and an inconvenience, which also take up more space and RAM. Dont start lecturing me on rooting, because 95% of smartphone owners out there doesnt know anything about it. They expect something expensive to work well right out of box. It is the manufacturer's responsibility to optimize the software, not us users. We are supposed to customize our device to suit our own liking - with or without rooting, not to do something which is the responsibility of the OEM. That design language is only used in flagship models for Nokia's case, 8xx (except 800), 7xx, 6xx, 5xx series look nothing like the N9. Samsung uses it for almost every single phone they are making now. Windows isn't ridiculously buggy? If you mean its slow them get a solid state drive. A ssd will make even the worst laptops fast. Tell me.. what's so wrong with "recycling"? If you were a company and your bottom line depended on sales.. and we're talking massive sales, would you make complete redesign changes that the "fans" ask for at every product iteration? Overhauling successful products is a MASSIVE risk, so companies usually don't do it. If they find success with a design, they will stick with it for as long as possible. People complain about the design of the GS4, if the responsibility was in your hands, how would you design the phone? How much different could it be? I've extended my stay in Germany to pick up the first Note III before i returned to the U.S.A.. I think i'll pass and wait, pick mine up in the US. Learned from the past months not to buy the first thing put out by Samsung. I bought a Note2 the day it was released. I'm still perfectly happy with the overall design of it. Only thing I wish was different was no glossy coating and a matte or rubberized finish. I also like the GS4 design. I will not be at all upset if the Note 3 follows directly in the footsteps of the GS4, just bigger. I'll be shocked if it departs. I certainly hope the final screen size is 5.7". I didn't want the dimensions of the phone to increase, and hopefully at 5.7", it won't. I want to see full effectiveness & efficiencies of Evolved Exynos 5 Octa. Dream speeding up to reality, bring it on Sammy, the world is waiting...NOTE 111! Looks like a Chinese clone and seems like techkiddy copied and pasted a Note 2 and wrote fictional Note 3 specs. Gonna pass this up, tiny screen and no exynos 5420 version for LTE markets yet again, that Nokia Phablet with thin bezels leaked yesterday seems a bit more exciting. So we have something on picture one that could be an S4 or a Mega, the Note II on the 2nd and the Galaxy S4 March ads on the 3rd with nothing new on the HW rumors. Pretty weak compilation. Awesome, it already sounds far better than anything else coming out this year :) Can't wait to see what more things Samsung has done to the software. Unless your a hipster wearing skinny jeans it will fit in your pocket.